Digital Radiography - Country Veterinary Clinic, P.C. Radiography is a valuable diagnostic tool in veterinary medicine. As we continually strive to offer the highest quality medicine and diagnostic testing, we are pleased to offer digitally radiology services as a means of providing excellent care to our patients. A radiograph (sometimes called an X-ray) is a type of photograph that can look inside the body and reveal information that may not be discernable from the outside. Radiography can be used to evaluate almost any organ in the body, including the heart, lungs and abdominal organs, as well as the bones. The use of digital radiography allows us to quickly and and accurately capture high-quality images of your pet. These images can easily be enhanced or adapted on our computer to offer the best diagnostic value. Copies of the radiographic images canbe downloaded onto a CD or emailed to specialists for further evaluation, or to owners who want a copy of your pet's images. Radiography is painless, safe, and completely non-invasive, and it uses only very low doses of radiation. Because the level of radiation exposure needed to perform radiography is very low, even pregnant female patients and very young pets can undergo radiography. Radiographs can be used to evaluate bones as well as the size, shape, and position of many of the body's organs. The size of organs is important because some medical conditions - such as kidney, liver or heart disease - can alter the size of these organs. The shape and position of organs can be altered or distorted by certain medical conditions, including intestinal blockage or cancer. Tumors, depending on their size and location, can also sometimes be detected using radiography. Radiography can also be used to diagnose bladder stones, broken bones, chronic arthritis, hip dysplasia, certain spinal cord diseases, and a variety of other conditions. 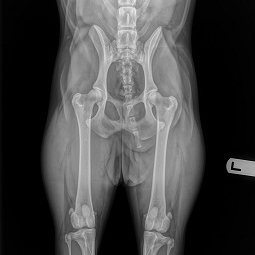 Radiography is an important tool that can help us make an accurate diagnosis for your pet. Our digital radiography service is staffed by careing, skilled professionals who will provide state-of-the-art care with compassion and expertise.